The eastern and southern regions of the land of Mordor. The lowlands of the south and east of Mordor. Beyond the range of Orodruin's fumes, Nurn was more fertile than the barren Plateau of Gorgoroth to the northwest. Its most important feature was a great inland sea, the Sea of Núrnen, fed by four rivers that flowed through the lands of Nurn from its surrounding mountains. 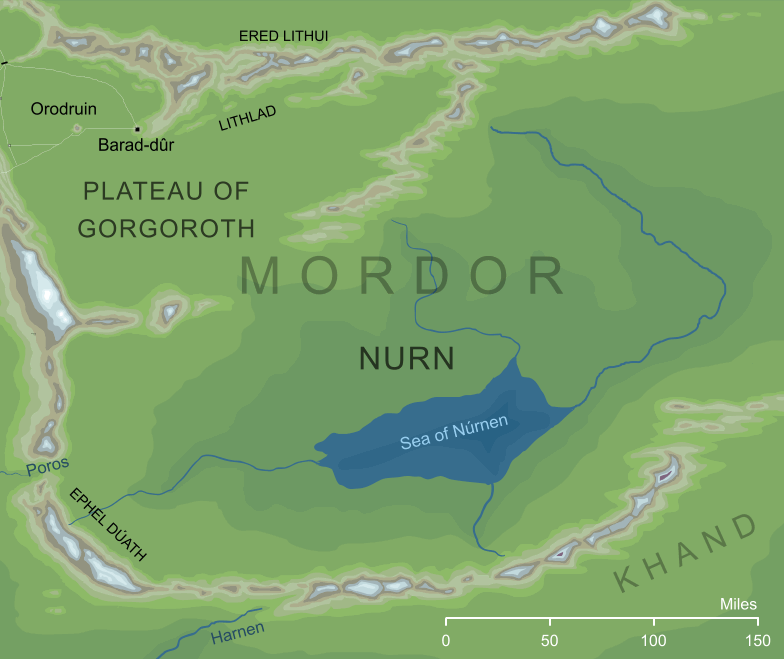 Under Sauron's rule, Nurn was peopled by slaves, who worked its fields to produce food for the soldiers of Mordor. After Sauron's defeat in the War of the Ring, King Elessar released these slaves and granted them Nurn as an independent land of their own. This interpretation is based on 'Sad Water' as a translation for the (presumably related) name Núrnen. Original content © copyright Mark Fisher 1997-2000, 2008-2009. All rights reserved. For conditions of reuse, see the Site FAQ.